The Red Cross is helping people in Texas and Oklahoma where devastating floods and tornadoes pounded the states over the weekend. More than 220 people spent their Memorial Day in Red Cross shelters in the two states. 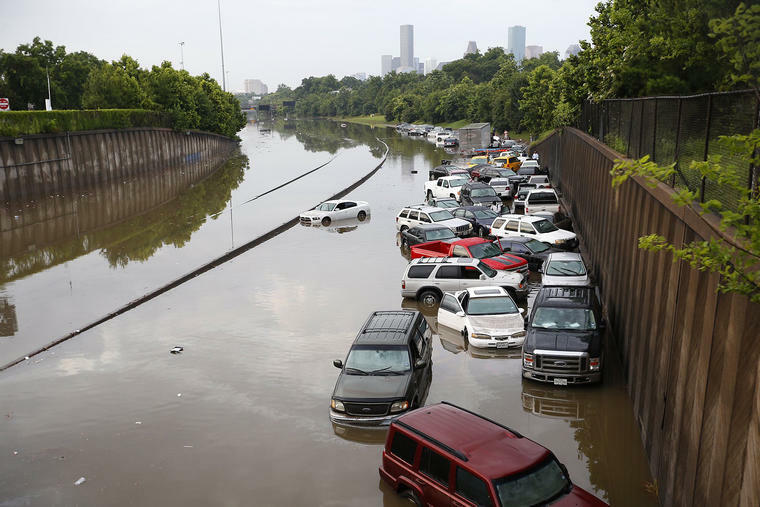 Governors in both states declared disasters in more than 80 counties after the extreme weather destroyed or damaged thousands of homes and left thousands without power. In addition, Red Cross disaster mental health counselors are reaching out to recent victims on-the-ground in Texas. Read how counselors like Richard and Carolyn Newkirk use their specialized skills to counsel children and more in a new article. At the Red Cross, we understand how one dedicated person – despite the odds or circumstances – can have a profound effect on a community or an individual. For Chicago Red Cross Volunteer Laura Landoe, the difference she makes is quiet and intimate. Landoe is one of a handful of volunteers who work with the No Veteran Dies Alone program at the Captain James A. Lovell Federal Health Care Center at Great Lake Naval Station in North Chicago, Illinois. The No Veteran Dies Alone is a palliative care program designed to provide the best quality of life for patients who no longer respond to medical treatment at the Department of Veterans Affairs medical facilities across the country. Landoe’s role is to provide companionship and assistance, giving constant bedside comfort and most importantly, ensuring that no veteran faces death alone. There are times she holds a veteran’s hand, talks with them, reads to them and sometimes, sings hymns to them. This Memorial Day as we fire-up the grill, head for the swimming pool, gather with family, and celebrate the start of summer, let us stop and remember the real reason for this holiday. It’s an opportunity to honor the men and women who have given their lives in service of their country while serving in the U.S. Armed Forces – and people like Landoe who serves our country in her own special way. For more information about Services to the Armed Forces at the American Red Cross Gold Country Region, click here. All in one day, a home fire, a hurricane, or even a sudden accident can change a person’s life, leaving him or her feeling helpless. Thanks to generous donors, the Red Cross is able to respond, providing hope and lifesaving assistance when it is needed most. Home Fires are the biggest disaster threat people face in this country. 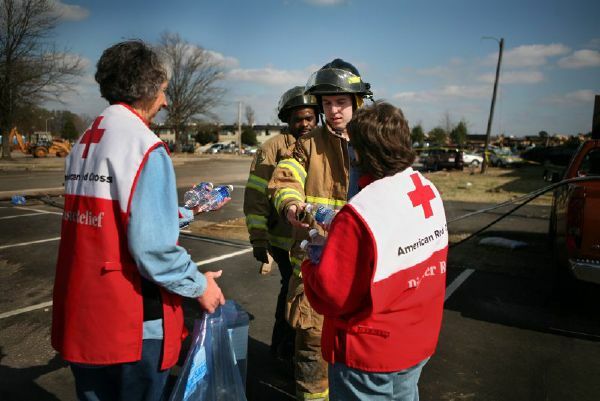 Every eight minutes, someone in the US the Red Cross responds to the home fire. Last year, the Gold Country Region alone responded to 645 local disasters. Most of these disasters never make the news. That doesn’t mean these disasters are any less devastating to the families affected. 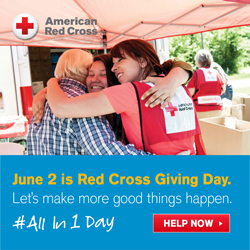 On June 2, 2015, the entire American Red Cross community will unite to launch our first nationwide Giving Day. Our goal is to inspire the single largest day ever of giving to the Red Cross outside of major disasters. Families, friends and coworkers across the nation will come together to sustain critical Red Cross support. All in one day, thousands of people will help ensure that survivors of disasters large and small, patients in need of blood, and military families will not face crises alone. When you make this gift, you go all in—providing aid to military families, ensuring a stable blood supply for our nation, saving children around the world from preventable diseases like measles, providing lifesaving trainings, and enabling the Red Cross to respond, on average, to a staggering 190 disasters each and every day. Your gift on or in advance of Giving Day will help ensure the Red Cross is there for years to come. For those who like to plan ahead (or are worried you’ll forget come June 2), we set up a Giving Day donation option just for you! Now through June 1, you can simply visit the Giving Day website, enter your information, and your donation will be processed on June 2 along with all other Giving Day donations. This method frees up your time on June 2 so you don’t miss out on being a part of Giving Day activities in your community. HOW WILL I MAKE AN IMPACT ON GIVING DAY? One day can change a person’s life in a way they didn’t expect, in a way that left them feeling helpless. Your support allows the Red Cross to be there so people in need can get back on their feet. Thanks to generous people like you, the Red Cross is able to respond to emergencies and provide life-saving training. On June 2, let’s go “all in” and make this day count. Schedule your donation today for Giving Day at redcross.org/givingday. You can also help build awareness by using the hashtag #allin1day on Twitter and Facebook. Emergency Response Vehicle drivers Vicki Oczkowicz and Brenda Clampitt hand out snacks to firefighters at Union University, Jackson, Tennessee. National EMS Week, May 17-23, 2015, is the perfect time to honor our local EMS professionals and promote awareness of their everyday service to the public. Here at the American Red Cross we partner with EMS professionals and together we are the first to arrive on the scene of a house fire, flood, or any other disaster. During this coming week, we’d like to honor our local emergency service providers and thank them for their selfless acts of daily heroism. CEO and President Gail McGovern and Chief International Officer David Meltzer recently returned from visiting Nepal following the devastating 7.8 magnitude earthquake. During their time in country, they visited remote communities impacted by the disaster, and spoke with earthquake survivors as well as Nepal Red Cross employees and volunteers, many who lost everything in the earthquake but continue to help others in need. In this video, David interviews Gail about what she saw on the ground, what is most needed, and how our work in Nepal helped prepared many people ahead of the destruction. Also see Gail’s blog: Gail McGovern: Stories of Resilience from Nepal. And remember, our community was able to raise close to $445 thousand dollars during the KCRA telethon just a few days after the quake. Thanks again! Yesterday was a great day for the Sacramento region and its surrounding communities. The American Red Cross Gold Country Region was one of 529 local non-profits who took part of the 2nd annual Big Day of Giving. Altogether, there were 36, 531 donations totaling $5, 613, 700! Woo Hoo! The @RCSierraDelta numbers are pretty awesome as well. We doubled last year’s donors to 182 this year and raised $25,545, compared to $15,000 last year. We are so very thankful to each and every one who clicked to donate; we wouldn’t have been able to break our records without you! We appreciate your support of to your local Red Cross. Thanks to your donation, we will now be able to provide shelter to 11 families for 3 nights each after they are displaced from a disaster. Several comfort kits, snacks, and two hot means for someone who has lost their home in a fire. Big Dog 2015 was also organized in more than 100 communities across the country with the hope of reaching millions of donors and raising over 100 million nationwide, each community rallied support for the vital work of local non-profits. It’s a day of celebration in Gold Country!! Sacramento Region is Opening their Hearts and Their Wallets! The Sacramento region “Big Day of Giving” is here! This is really exciting for the Red Cross because GIVING BIG is what makes our mission happen. EVERY 11 HOURS Red Cross volunteers are out helping families who have lost everything, usually in a house fire. The cost of providing lodging, food and necessities for these families – about $550 per day – is covered entirely by the generosity of our donors. We receive no government funding to help these families, so our volunteers provide immediate comfort and our donors make sure they have a place to go. How can you help us help them? 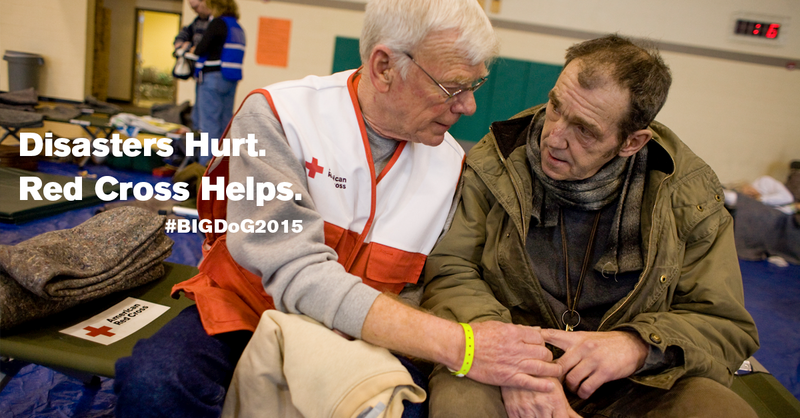 Give to the Red Cross today through the Big Day of Giving. Our link to the Big Day is below – by clicking on that link and making a donation, you’ll be linking those we serve to the things they need. Every donation makes a difference to those we help. It’s a big day to meet some big needs – with your help we can make this happen! BIG DAY OF GIVING HALFTIME CELEBRATION! WHERE: Cesar Chavez Park 9th and J streets, Sacramento, CA. WHAT: Your local chapter of the Red Cross will be there with goodies, some of our nurse volunteers will be doing blood pressure checks and you can check out the ERV (Emergency Response Vehicle). Join us as we celebrate the first 12 hours of the campaign! WHAT: Cinco the Mayo Fiesta at our headquarters as volunteer make thank you calls and cards for our amazing donors. Posted on May 5, 2015 Author Gold Country CrosswordsCategories UncategorizedLeave a comment on Sacramento Region is Opening their Hearts and Their Wallets!